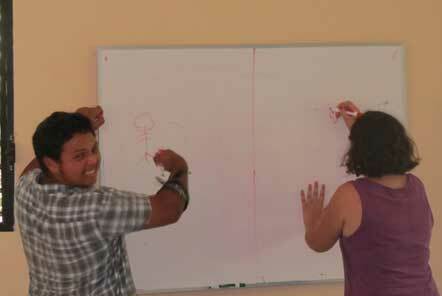 Erin from the Pod Volunteer office returned to Belize to revisit the projects we work with there. 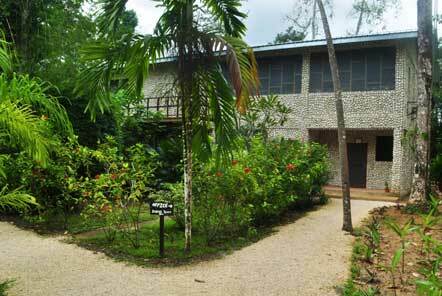 In this part of her Belize blog she returns to the Caribbean Wildlife project. I was met at the airport by Jamal (head of the education department and volunteer coordinator), it was great to catch up and hear more about recent developments at the project. On arrival at the volunteer accommodation I saw that the TEC building (where volunteers eat meals, relax in the evenings and can use the wifi) had had a makeover and looked great! A great development at the project is the combining of the two main roles (animal management and education department). These are the two most important foundations to the centre and because of the nature of the work; these two roles can overlap so volunteers now get the opportunity to be involved in both aspects of these roles during their placement. During my last visit I had assisted with the animal management role and so it was great that this time I had a chance to become a supervisor at the centre’s conservation camp which is part of their education programme for the community. The camp runs once a year to inspire the next generation of conservationists. This year they had twenty-eight 12-17 year olds. Jamal used to attend these camps as a child and so is one of the success stories of these camps, now heading the education department at the centre. A maximum of 30 campers are allowed each year and three of this year's group had attended previous camps which was great to see how keen they were to return and learn more. The centre charges a very small amount to each camper for their stay which does not cover the full cost of the camp (and this is usually subsidised by the centre). This year we were proud to be able to assist with the funding of the camp through a Pod Charity grant. The camp started with registration and a tour of the centre where the campers got to know some of the species with the pre-warning that some of what they learned on the tour would come in useful later in the day when there were quizzes and games based on the knowledge gained from the tour. After the tour we headed to the classroom for some ice breaker games so help the group get to know each other as they had travelled from all over the country for the camp. The afternoon was spent playing quite a competitive game of Pictionary based on the animals that they’d seen during the tour. Categories included mammals, birds and food. Food probably proved the hardest topic but was great for learning as the team’s chosen artist would have to draw the food that the animal on the card eats, so for example if they drew a peanut, the answer could be macaw. 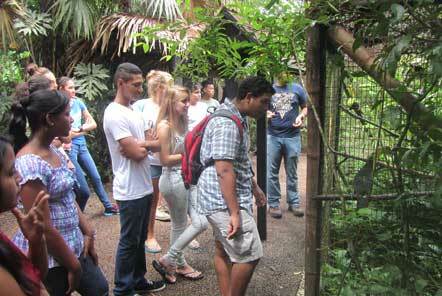 We then had a presentation about the ecology of Belize and an introduction into signs and tracks of native species. Afterwards we went on a nature trail around the savannah areas of the centre. This put some of our orientation skills to the test when we realised that the map was wrong! Some of the children were great at keeping spirits high and taking a leadership role, suggesting which direction was the right route. These sorts of skills are identified by the camp supervisors as at the end of each conservation camp, one member of the group is awarded ‘camper of the year’. That evening we headed back to the centre after dinner to go on a night tour to see how the nocturnal animals behave which is a great and completely different experience, seeing many animals that you can’t see during the day. We visited the paccas, owls, pumas, margay and heard the howler monkeys where we learned a great fact: did you know that the howler monkey’s howl which can be heard up to 3 miles away, is used for the sound of dinosaurs in the film Jurassic World?! It’s a very eerie sound when you’re in the middle of the centre with your torches switched off! 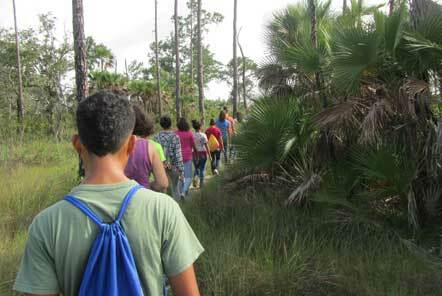 The rest of the conservation camp included activities such as talks from the centre’s founder, lectures on tapir tracking in the local area with a practical experience of this and talks from members of conservation initiatives around Belize. The groups had also all chosen one animal per group, this was their group name and would also be the animal which they had to create a marketing campaign for, based around that animal’s attributes which they would present at the end of the camp. One of the favourite activities on camp was where the children were asked to come up with questions about certain species which could be answered by observation techniques. This was a really good way of getting the children to learn because, by being allowed to create the questions, they had a vested interest in the results and they were the ones observing the animals, collecting and recording the data to analyse later and make some assertions about that species’ behaviour. Whilst I was there I was lucky enough to meet a vet who was staying at the centre for a week and was giving daily talks with the keepers on topics such as nutrition and enrichments and the volunteers were able to sit in on their talks which was great. 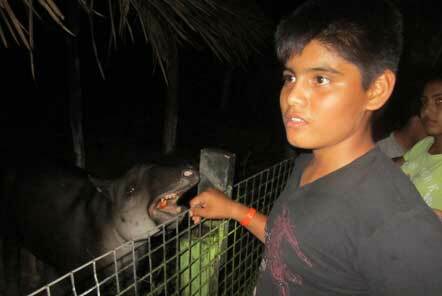 We also got to witness the tapirs being given a physical examination to check their general health. It was really good being able to be involved in both the hands on animal side of things as well as the education programmes that the centre runs, as they are so intertwined and reliant on each other to make the centre a success, it’s great that volunteers are now able to have this variation to their role.